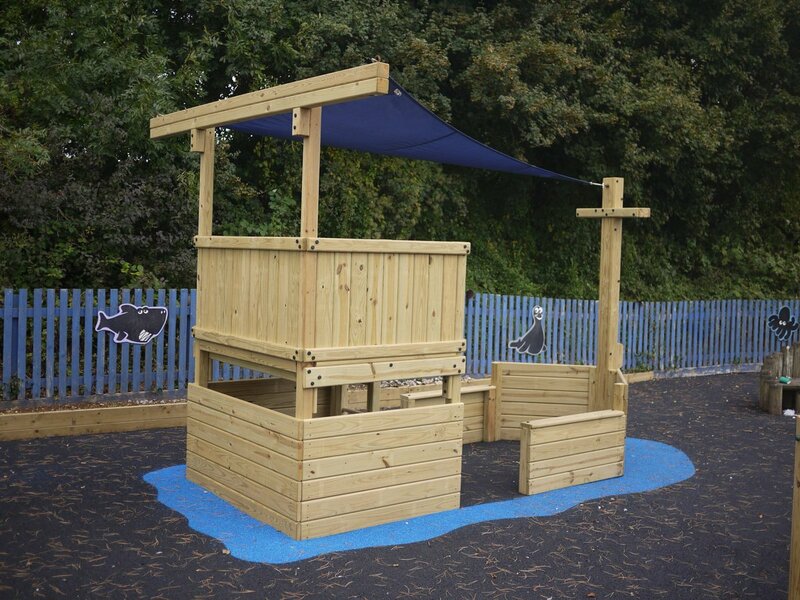 Perfect for a school playground or any play area with some sort of nautical theme, our Playground Ships include all the traditional play activities such as slides, climbing nets etc but with the added benefit of adding a real adventure play element. There are places for the bold play captains to direct the action as well as cosy compartments for secret meetings. And as well as these traditional play activities you can add a shade sail to protect the young sailors from the sun while stressing the naval theme. And they are not just for schools either – if your pub is by the sea, near a lake or river or has some sort of naval link why not make your beer garden a special place for families with one of our fabulous Adventure Ships ? Below you can see our range of adventure play ships from the Mini Ship which is ideal for the smaller area or younger users to the massive Mega Ship which is loaded with all sorts of playground activities. And of course we can design and build that bespoke custom ship for your own play area. For more inspiration, here is a page of previous Adventrure Ship installations. Mini Ship – A simple 1.5m x 1.5m deck with side/back rails, ladder, lower enclosure and bow section. Total length 4.5m plus whatever accessories you want to add. Standard Adventure Ship – This has a single bridge deck with lower cabin walls, a wood roof plus a GRP slide, rock wall, cargo net and a forward section with a mast, portholes and anchors. Overall width 1.8m. Super Ship – as above but comes with two bridge decks with a walkway connector, lower cabin walls, a roof over one deck and a shade sail over the other, a GRP slide, cargo net, rock wall and a forward section with mast, portholes and anchors. Overall width 1.8m, length 10m. Mega Ship – has all the features of the Super Ship, but with a double bridge deck at the stern with play levels at 1.5m and 2.1m. This deck can be used to mount a fabulous enclosed spiral slide. This version also includes a small foredeck with railings. Overall width 1.8m, overall length of ship alone 1.75m. And if you want to see some more examples of the sort of playground ships we can provide, click on our photo gallery.